World Autism Day was a real pleasure to be part of. Teachers danced at a Danceathon and students cheered to raise money for Jockey Club Sarah Roe School. After a long term, the release of energy was cathartic and we are considering doing this once a week for all our well-being. Mr Bengey won the Most Impressive Moves category and Miss Cunliffe the Most Innovative Move. (I won’t share who won the need for most improvement). As well as our non-uniform day and the work of our PTA, this community raised HK$73,783 towards an additional modified school mini bus for children with a disability. Once the afternoon party had finished, I received contact from families at West Island who were hosting the Laos Under 16 Girls rugby team. The team came to Hong Kong to play in the International All Girls Festival at Kings Park last week. An incredible group of ladies, many of whom had never left their country, let alone given the opportunity to play rugby against teams from Japan, Australia, Guam, Singapore and or course Hong Kong. Of all the problems these ladies have in their lives, its footwear and sports bras. They are short of over 1000 pairs of football boots with many of their players having to play in flip flops. Are you up for the challenge? Given the sevens has been and gone, the rugby season has finished and most students are likely to go up a size before next season, do you think we could get as many pairs of boots together as we can? Please don’t give us the worn out things that should be in the bin, but if you have some boots that are hanging around, hardly used, in good enough order to pass on – there is a home here. Please send them in to reception during the first week back and let’s see what we can do. Our own Under 13 Rugby Girls team have enjoyed success throughout the HKRSU competition held in March and achieved first place victory for West Island School. Further success for the twenty students who have taken our future proofing course in Sports Leadership. They planned and delivered a morning of activities for over 100 ethnic minority students within our HK community over the public holiday. The students were a credit to the school and we are very proud of their service. Well done also to all students who took part in the ISSFHK Athletics. 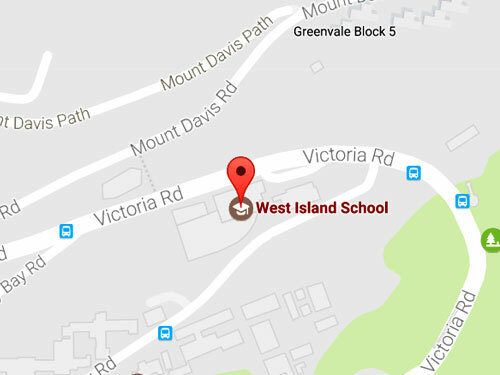 West Island Athletics Squad competed in the Under 16 and Under 20 ISSFHK Senior Athletics Championships earlier this month and produced some stunning individual times and team results. Under 20 girls and boys overall winners as it happens. Finally, for her individual performance, a belated well done to Jade Leshetz who rode in the Senior Interschool competition. It was a combined competition with Jade starting early morning with dressage followed by showjumping and cross country. With full determination she took third place in the Interschool competition for WIS. Simply brilliant Jade – you have worked consistently and with determination over your entire time at West Island and we hope to attract more riders next year to follow in your footsteps. These last few days before Easter have continued to be busy with Brilliance in Business on Thursday and Year 13 Graduation today. Graduating class of 2019, what an amazing group of students who we have the privilege to teach and learn from. Your humour, style, service, friendship, Diwali dancing skills, sporting ability, energy and at times challenge have been appreciated by everybody here. Leave us knowing the incredible job you have done in making this school stronger because you were here and because of what you did. Seize the next opportunity with love and energy and come back to share what you have been up to and if you need us further, we are here for you. I hope you feel the personal fulfilment that we wish for you.